On August 13, 2016, Angel was preparing to drive to her accountant to work on her taxes. Her granddaughter was begging to come, but Angel insisted that she stay at home (thankfully she did). While driving on Bronx Boulevard and passing the intersection of East 241st Street in Bronx, NY, another vehicle struck the driver side door of Angel’s car. The t-bone collision pushed Angel’s vehicle into a column on the passenger’s side (where her granddaughter may have been sitting). Angel hit her head on the roof of the car. She remembers a male and female get out of the vehicle that struck her after the accident. They checked to make sure she was ok, and they got back into their vehicle and left the scene! Angel was transported by ambulance to Montefiore Medical Center ER. She was evaluated, provided an injection of Ketoralac for her neck, head, shoulder and back, and discharged home. Due to the incident, Angel suffered injuries to her neck, lower back and left shoulder. An MRI of the left shoulder revealed a significant partial rotator cuff tear. She also suffered disc herniations with multilevel disc bulges in her cervical and lumbar spine. When minimally invasive and conservative procedures failed to improve her condition, Angel underwent left shoulder surgery and was prescribed aggressive therapy to maintain her range of motion. While the surgery and therapy have helped reduce her pain and increase her range of motion, Angel will experience these symptoms for the rest of her life. Angel will need therapy, injections and pain medications indefinitely and intermittently. In the future, Angel will need a total left shoulder surgery. 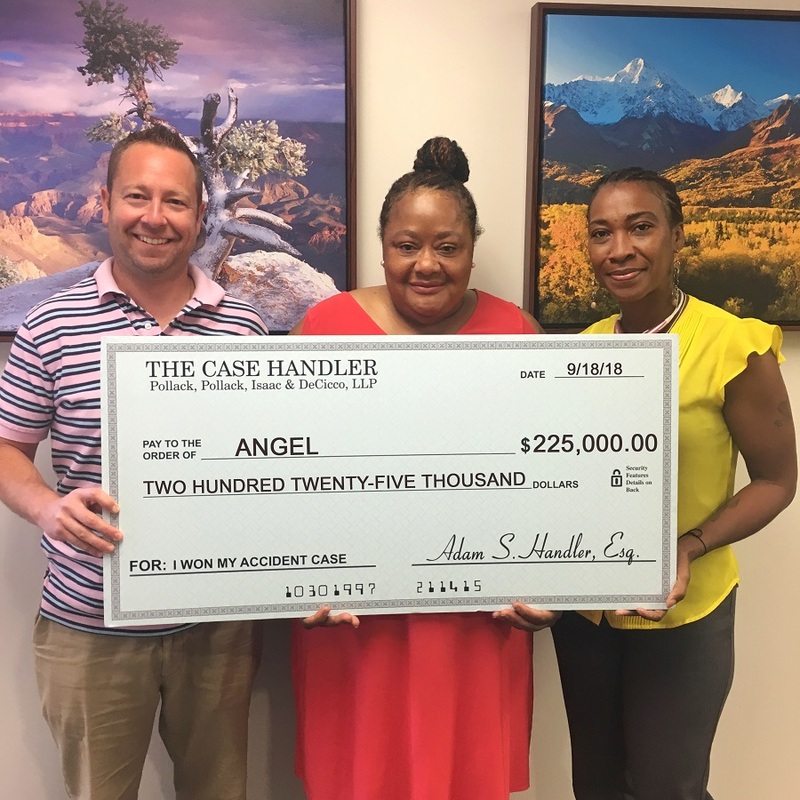 Angel’s cousin is a past client of The Case Handler team and recommended her to our firm! With the help of our experienced NYC hit and run car accident attorneys, we successfully located the vehicle and drivers that fled the accident scene. Our team recovered the maximum policy limits ($25,000) from the Defendant’s insurance company. Since Angel had Underinsured Motorist Coverage / Uninsured Motorist Coverage (UIM / UM) on her own insurance policy, we were able to recover an additional $200,000.00 for a total settlement of $225,000.00! Driving away after an accident is never a good idea. You can run, but you may not be able to hide from the police, or worse, The Case Handler team! Thankfully, we found the at-fault driver in Angel’s accident, but that isn’t always the case unfortunately. That is why we highly recommend adding UIM/UM coverage on your auto insurance. If you are ever hit by a car without car insurance or not enough insurance, UIM/UM coverage is a safety net that will protect you in that event. If you or a loved one are injured in a hit and run car accident in New York, contact an excellent NYC hit and run accident attorney that will “fight for the max”.